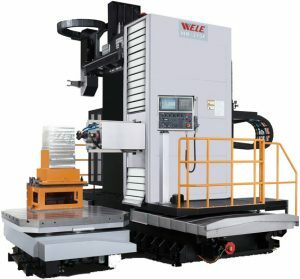 Two kinds of spindle, Ø110mm (W travel with 500mm) and Ø130mm (W travel with 700mm) quill type and Ram type combined with quill travel, provides all kinds of applications. Specified Hydro-static bearing offered heaviest loaded on the index table. 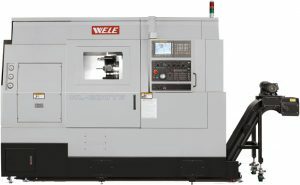 4000rpm geared spindle with 1,076Nm/793ft-lb offered as STD, 8000rpm built-in spindle with 600Nm/442ft-lb as Option. Patented backlash eliminated mechanism gives index table backlash free on the table smaller than 1600x2000mm, two servo motors convert on the table bigger than 2200x2500mm. 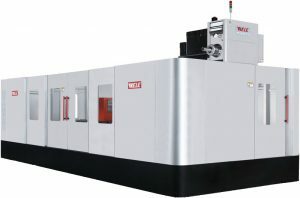 Power turrent (BMT65) has 2.7kW power. Increment indexing degree for 0.001 degree on C axis. Main structure and key components are WELE own development and manufacturing. Rapid federate for 60m/min and rapid tool exchanging (T to T) as 1.7 sec. 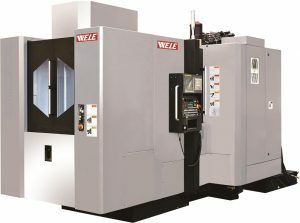 Equipped with WELE own design high speed built-in spindle(15,000rpm). Available extended to FMS (Flexible Manufacturing System) for 6~10 pallets.